Good morning! It's matchday again @The Cathedral of Football. The opponent today are the team every MetroBulls fan loves to hate - DC United - aka The Forces of Darness (7:30pm ET, MSG). 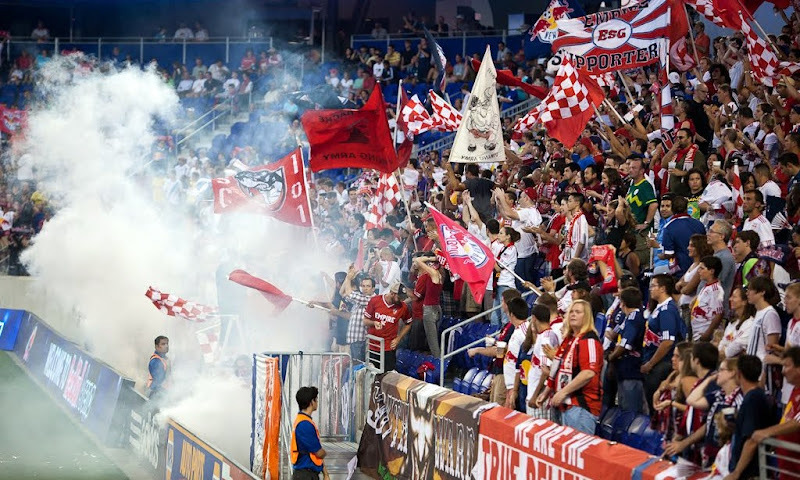 With the Red Bulls still on a high from Wednesday's destruction of TFC, will we see another massive victory today? That remains to be seen. In the meantime, let's see how both teams come into this one. DC United are coming off a dissapointing home draw (2-2) against the Philthadelphia Union. They're mired in 6th place of MLS' weak Eastern conference and have not won a game since May. That's five games without a win. They'll also be looking for revenge against RBNY, for that 4-0 rout they suffered a couple of months ago. Former Red Bulls midfielder Dwayne De Rosario will, no doubt, be looking to make a statement against the club that gave up on him so quickly. The Red Bulls are coming off their most emphatic victory of the year, a 5-0 thrashing of Toronto FC. Thierry Henry, Luke Rodgers, Joel Lindpere and Juan Agudelo will be looking to continue their goal scoring exploits against a hated rival. Teemu Tainio will be missing, due to yellow card accumulation, and Rafa Marquez is still not yet recovered from the injury he suffered on Gold Cup duty. New man Dax McCarty, who'll be looking to prove the Red Bulls got the better end of the recent blockbuster trade, will have to contain (in the midfield) all by himself. With all that in mind, let's get to some predictions. Given the lopsided history of this rivalry, I'm tempted to predict a DeRo hat trick for DC and another horrible goalkeeping meltdown for the Red Bulls. However, DC have not won in a month, the Red Bulls are a better team 1-11 and they should have the benefit of a huge home crowd behind them. RBNY also demolished TFC on Wednesday, and that has to give them some confidence coming into this one, as does the fact that they've only failed to score in two games this season, both away from home and a long time ago. Tainio's absence makes me a little nervous, I must admit. Taking all that into account, I will predict a 2-1 victory for the Red Bulls. Henry victimizes DC again, Lindpere continues his hot streak, and Najar torches Roy MIller for DC's lone goal. I'm going to go all out and predict our sencond consecutive win. The Red Bulls will take the momemtum from the TFC rout and stuff DC today. I'm going to say: 3-0 to RBNY. DC hasn't scored on us since June 4th, 2009. Given our goalkeeping streak and Teemu being suspended (inevitably bringing in Ballouchy), I won't be surprised if that milestone finally falls. But that Toronto game has fired up the team and the fans, and I'm hopeful it wasn't a fluke. 3-2 RBNY - Henry, Lindpere, and Rodgers to seal it for us over a Najar strike and a Davies flop in the box to draw a PK. Ok, that's all for now. We'll have our usual, Award Winning coverage of this one in the next day, or two. I won't be at this one, unfortunately, so Matt Conroy (aka Who Shot Sam) will be doing his best Big viper impersonation with the video. Onward, to victory! Hope we win or Same old metro like always? @$&!